Back in Action is a family firm established over 30 years ago. We are ethically and passionately against the distribution of personal data. We have never passed on personal data to an outside company for marketing purposes. Recent laws have been introduced in order to force other companies to follow our already high standards, and these new laws are called GDPR. Customer trust is our biggest asset, and if you'd like to see what our clients think of us please visit Trustpilot. Back in Action have been compliant with the intention of the new rules for many years, and we are delighted to be able to confirm some minor changes so that you can know what we do with your data. We understand some people are wary of entering Credit Card details into online orders. Our web site therefore has a unique feature whereby you can fully complete a web order without making payment, and then conclude payment with one of our staff after checking the order is right for you etc. Telephone payments are processed via Global Payments - reputable payment processors. Payments made over the telephone or instore require us to process your payments and store your payment data. We do not keep this data in electronic format but do hold paper copies which we keep secure for the timescale defined HMRC, currently six years after which they are securely destroyed. We may change this policy from time to time by updating this page. You should check this page to ensure that you are happy with any changes. This policy is effective from May 2018. If you make a purchase: We will require your personal details including name, address, and a minimum of either telephone or email. The information about which pages of our web site you visited at the time of your order are filed with your order. If you don’t want us to know which pages you visited simply close that option when ordering. If you make a general or specific enquiry from us: If you choose to provide it, then in order to facilitate communications with you we will record personal details such as your name, email address, postal address and telephone number either from information that you have given us whilst using the website or from any personal correspondence with us, including our enquiry system and emails. Information about which pages of our web site you visited at the time of your enquiry are filed with your enquiry. If you don’t want us to know which pages you visited simply close that option when ordering. We also automatically collect information, but not personal details as per the last paragraph, about your visit to our site using Google Analytics. This information is used to make your visit to our site more efficient, and to help us follow browsing preferences on our site so that we can make regular improvements. Legitimate Interest: What we do with the information we collect and why we keep it. Let’s face it Back in Action is not an ordinary retailer. 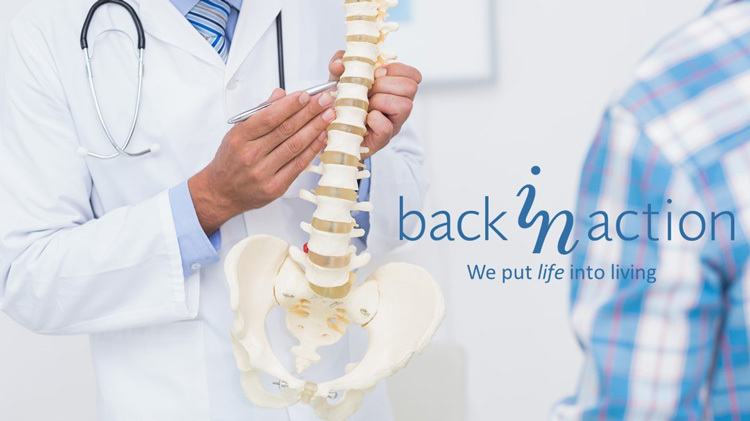 Many of our clients are attempting to recover from extreme back pain, and for them we run a consultancy system that allows them to get e-based advice and guidance 24/7. The prime use of this system is to support users of our exceptional Mobiliser system. This is an example of a genuinely valuable use of email tracking and cookies ... we can see if Mobiliser users received our last piece of advice, and if it is essential advice that might be missed we can resend or call them. By this system we help thousands of people a year to recover after years of pain. As you can see, not all uses of cookies and personal data storage are troublesome or inappropriate. The new GDPR rules mean that every company must analyse whether the storage of personal data is of legitimate interest to either customers or the company, hopefully both. Our analysis is that we both have a legitimate need for retaining data that could not be achieved by other means. That’s why we are stating below what we consider to be legitimate interests for each reason for requesting, using and holding personal data. We will not sell, distribute or lease your personal information to third parties for their marketing purposes. We will use your personal details in order to respond to your queries about the services we provide. We will use your personal details for fulfilment of your order and to manage any future service issues. If you sign up for our newsletter may periodically send promotional emails about new products, special offers or other information which we think you may find interesting using the email address which you have provided. To sign up please CLICK HERE. We preserve your personal data and its link to the products you have purchased from us, and subsequent correspondence and events, in order that we can assist you with future advice, spare parts and service requests for the conceivable lifetime of the product. Many of the products supplied 30 years ago are still being used today and customers sometimes need replacement components to retain function – which we are pleased to provide whenever possible. We will also use this information to offer you, from time to time, good advice regarding the longevity of your product. Should the product reach a stage where the spares are not readily available we may contact you to advise on methods of retaining the products benefits to you, including if appropriate identifying similar or alternative items. If you would like to limit the amount of time that we keep your personal data related to purchases then we will on request delete your personal data. You will rely in future on your receipt [of purchase] to find details about your product. If you choose this option please remember that only your original receipt can be used for future comms. Third party services such as YouTube, Google Maps, Twitter, Facebook, Trustpilot, product demonstrators and product configurators may also issue cookies. You can find out more about what cookies are, how to control them and delete them here: www.aboutcookies.org You can choose to accept or decline cookies. Most web browsers automatically accept cookies, but you can usually modify your browser setting to decline cookies if you prefer. This may prevent you from taking full advantage of the website. You may request details of personal information which we hold about you under the GDPR Regulations 2018. If you would like a copy of the information held on you please write using the contact page of this website. As we said above ... Many of our clients are attempting to recover from extreme back pain, and we run a consultancy system that allows them to get e-based advice and guidance 24/7. Our newsletters employ tracking so that we can monitor at an individual level whether a recipient has opened the email and what content they have clicked on. We only send our newsletter to recipients who have signed up to receive it. Recipients are able to easily unsubscribe from the newsletter if they wish. Hard copies of purchase transactions, VAT forms and cc receipts from telephone or instore sales are filed temporarily at the relevant store and regularly transferred to HQ at Amersham where they are stored in a locked room. When records reach seven years they are shredded by a secure authorised company. After that point we can still access your data to help with product service unless you have requested us to delete your data as above. Please note that calls to our shops may be recorded for training and quality purposes. Hopefully you are reassured that we are a trustworthy place to order from. If you would like to know about our star products or to read what our clients say about us on an independent review site please see the links below.